Cells of the cyanobacterium Synechococcus elongatus spotted at different positions of a line all grew toward a lateral light source (bottom). The flow of cells spreads out as cells move. Long-time incubation causes the populations to run into each other, giving the appearance of a Christmas tree. The “stars” appear when cells are inoculated along a circle on a plate covered with aluminum foil with a hole in the center. The cells move toward the center towards light, which leads to the star-like shaped colony. Microscopic organisms known as cyanobacteria, often called “blue-green algae,” have been a staple in laboratories around the world for more than four decades for researchers studying everything from biofuels to new therapeutics. University of California San Diego Biologist Susan Golden and her colleagues have used cyanobacteria as a key model for circadian rhythm studies, analyzing the organism’s 24-hour regular cycles that operate with the precision of a mechanical clock. The cyanobacterium Synechococcus elongatus is broadly used for such studies by Golden and others because of its ideal traits for laboratory studies, including the fact that it does not settle down on a surface or move…. or does it? Now, Golden, postdoctoral researcher Yiling Yang and their coauthors have published a study in the Proceedings of the National Academy of Sciences with surprising results about a type of Synechococcus elongatus found in the wild. The researchers discovered that not only can these wild types move with tiny feelers called pili, but they do so in a strategic survival mode in accordance to the light they sense around them. When growing under lateral uni-directional illumination, wild Synechococcus elongatus cells move toward a light source by forming finger-like structures. 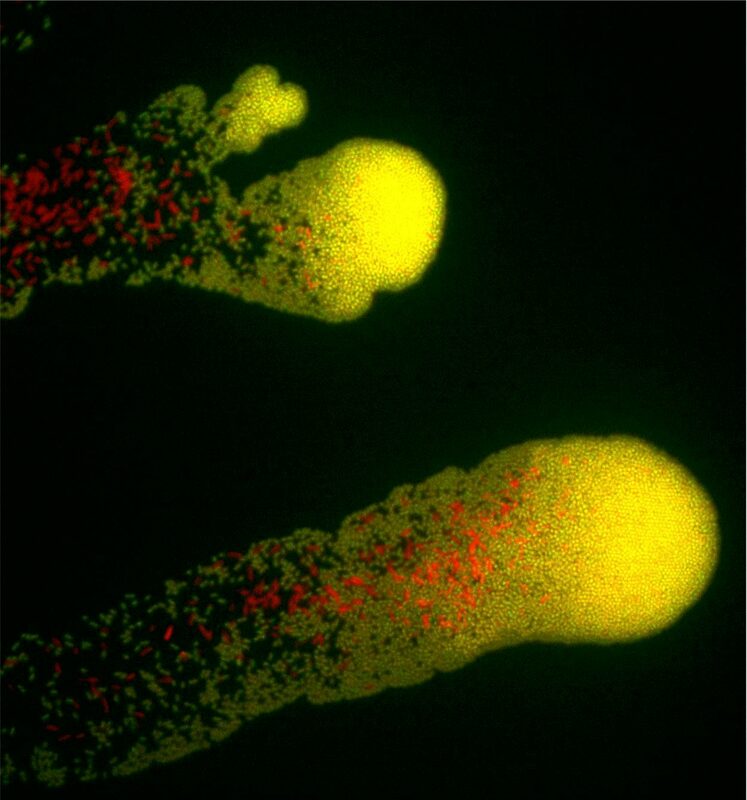 Red autofluorescence indicates the population of the lab strain and the cells that exhibit yellow fluorescence are the motile wild strain (labelled with yellow fluorescent protein). Thus, Yang, Golden and their colleagues concluded that the organism used in studies for so many years has undergone evolution in the laboratory that makes it highly valuable for research studies, a transformation described as “accidental domestication” (not unlike relatives of wild wolves evolving to our domesticated dogs). In the same way that humans respond to light levels—using the sun to acquire valuable vitamin D or protecting against damage from sunburns, for example— Synechococcus elongatus similarly appears to position itself in nature to acquire appropriate levels of light. Golden says the organism secretes a “biofilm” substance to attach to rocks or debris and probably moves around strategically in these layers to best orient to light.